Although the media headlines today are dominated by Russia, Saudi Arabia, speculation on China's slowing demand growth, and the tight oil drillers in the lower-48 states, it really was only a matter of time before other OPEC members reached a breaking point. And that's precisely where Venezuela finds itself today. What you might not know is that Venezuela actually has a very long history of oil exports. Not many people know that the first barrel of Venezuela oil was shipped abroad about 320 years before Col. Drake's famous well struck black gold along the banks of Oil Creek, Pennsylvania. Just after the Spaniards conquered the area, there were rumors that oil could be used to cure gout, which led to a barrel of crude being shipped overseas to Emperor Charles V (it's a shame it didn't help with malaria). But historical tangents aside, you have to ask yourself just how desperate Venezuela is over the potential collapse of its oil industry. I'll be the first to admit that I'm not a huge fan of Venezuela. Any time you need to physically hit your president in the head with a piece of fruit to get his attention, that might be your first clue that something is wrong. I guess he has other things on his mind, especially considering that his oil industry is on the brink of collapse. But just how desperate is the Venezuelan oil industry? Let's just say that it's been pushed far enough to go over Saudi Arabia's head. Just this week, the country sent its new oil minister on a mission to visit both OPEC and non-OPEC producers and plead with them to cut production. His travels included stops in Iraq, Iran, Qatar, Algeria, Nigeria, and Russia. Now, we've always known that Venezuela has been one of OPEC's biggest price hawks — yet it's for good reason. While the country reports a staggeringly massive amount of oil reserves — 299 billion barrels at last count — don't let it fool you. To say Venezuela's supply is of poor quality would be a gross understatement. We're talking about some of the dirtiest, heaviest, most expensive oil to extract in the world. Nearly 80% of those proven reserves, or 235 billion barrels, are found in the Orinoco Belt. Few countries have a higher break-even price than Venezuela. The IMF reported last October that Venezuela's fiscal break-even price was $117.50 per barrel. Personally, I don't know any oil bulls that believe crude prices will surge that much. It gets worse for them, too. Things are so bad now that Venezuela is forced to import light crude oil from the United States in order to help refine its heavy oil. Pleading its case to the world's largest producers, however, may not work out the way it's hoping, considering Venezuela's biggest enemy is Saudi Arabia itself. So you really want to know how bad things have gotten for Venezuela? When the House of Saud declared war on oil prices more than 18 months ago, it wasn't just on the tight oil companies in the United States. It was also on fellow OPEC members like Venezuela. Remember, oil ministers from Saudi Arabia have consistently argued that their main priority is to preserve the nation's market share — no matter who's in their way. Over the last decades, Venezuela's oil exports to the United States have fallen by more than 46%. Of course, you should also bear in mind that almost 90% of this oil was shipped to refineries along the Gulf Coast. And let's be clear here: the Gulf Coast is a crucial region for Venezuela's oil due to the fact that it's where most of the United States' heavy crude processing capacity is located. The problem is that Venezuela is quickly losing ground to its OPEC brethren. More than half of the oil that is shipped to the Gulf Coast comes from an OPEC member, and three-quarters of those OPEC exports consist of crude exports from Saudi Arabia and Venezuela. In fact, six out of every 10 barrels that the Saudis export to the United States end up going to the Gulf Coast. Now, considering that tight oil plays have almost single-handedly pushed U.S. oil output to over 9 million barrels per day over the last nine years, it's clear that the Gulf Coast has become a fierce battleground for foreign exporters. And if the situation is grim enough for Venezuela to send its oil minister around the world begging for a meager 5% output cut across the board, you can imagine how close its oil industry is standing to the brink. Energy and Capital editor Keith Kohl looks into the details behind the U.S.'s first crude oil export in decades. Energy and Capital editor Keith Kohl dives right into the growing spat between Iran and the rest of OPEC's largest players. 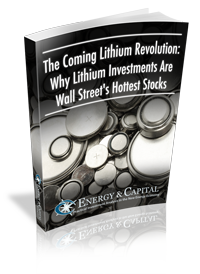 Energy and Capital editor Keith Kohl takes a closer look at the lithium revolution and why it could be the deathblow for oil. Energy and Capital editor Keith Kohl takes a closer look at the growing friendship between Putin and Saudi Arabia and offers investors a safe haven during an oil bottom.